AP Physics C aspirants are expected to have a fairly good idea regarding vector methods in Physics. AP Physics B aspirants also should have some idea of vectors. Today we will discuss some multiple choice practice questions on vectors. (1) The magnetic flux density B at a point P is 0.5 tesla. What is the maximum number of components into which the vector B can be resolved? The resultant of all possible components should make the vector B of the given direction and of magnitude 0.5 tesla. We can imagine an infinite number of components in various directions to combine and produce the field B and hence the correct option is (e). (2) The force F acting on a particle has its line of action (direction) lying in the XY plane and is inclined at an angle θ with the x-axis. What is the z-component of the force F? 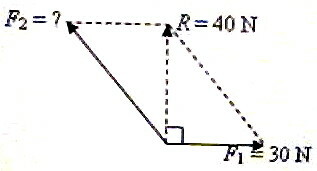 Since the direction of the vector F is lying in the XY plane it has no z-component. The correct option is (a). 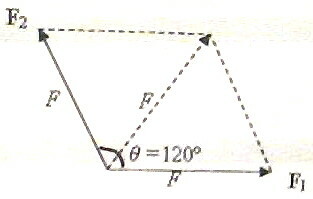 F = √(F12 + F22 + 2 F1 F2 cos θ) where θ is the angle between the forces F1 and F2. [The adjoining figure will be useful to understand how the two forces produce the resultant satisfying the given conditions]. The forces and their resultant are shown in the adjoining figure. F2 = √(302 + 402) = 50 N.
(5) Rain drops are falling vertically with a speed of 10 ms–1. A boy holding an umbrella runs southward with a speed of 5 ms–1. What is the direction in which he should hold his umbrella so that he will not get drenched? In the figure the velocities of the boy and rain drops are represented respectively by the vectors OA and OB. The relative velocity of the rain drops with respect to the boy = (velocity of rain drops) – (velocity of boy). tan θ = 5/10 = ½. Therefore, the boy should hold his umbrella at an angle of tan–1(1/2) with the vertical, towards south. (6) Suppose that the ground coincides with the XZ plane of a right handed Cartesian coordinate system and i, j, k are unit vectors along x, y, z directions respectively. 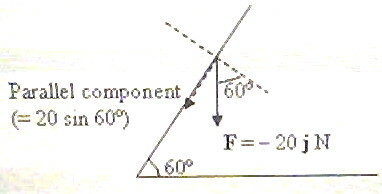 An inclined plane of inclination 60º is placed on the ground and a force F = – 20 j N is applied at a point on the inclined plane. What is the component of this force parallel to the inclined plane? 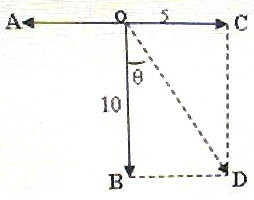 The force F of magnitude 20 N is directed vertically downwards (along the negative y-direction). With reference to the figure, you can easily see that the component of F parallel to the inclined plane is 20 sin 60º = 10√3 N.
The magnitude of the area of the parallelogram is equal to the magnitude of the vector product (cross product) of the vectors A and B. [Remember that area is a vector]. You will find similar useful questions (with solution) on vectors here.